Why are Blue Ridge Mountains blue? Why does the French Broad River flow south to north? Find answers to these questions and more when the Asheville Museum of Science opens in late September. 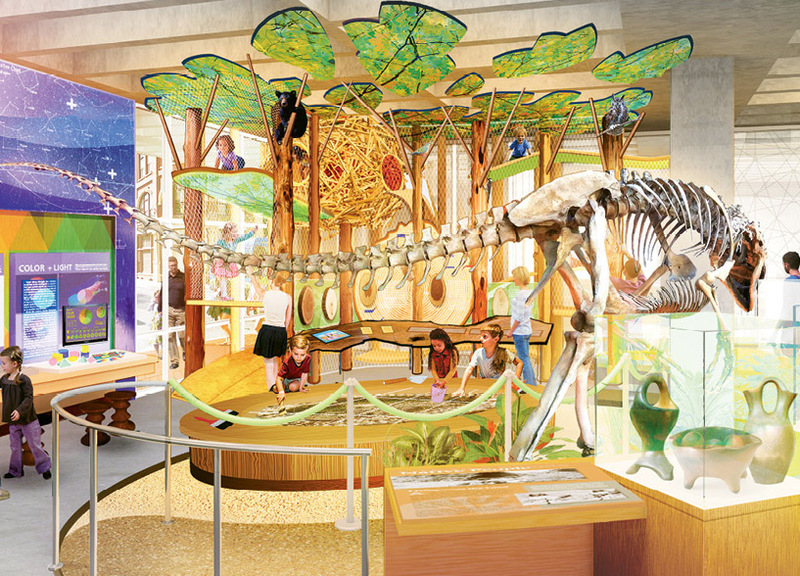 It’s a reinvention of the venerable Colburn Earth Science Museum, with expanded offerings. While gems, minerals, weather, and climate will still be in the mix, new interactive exhibits include one on Southern Appalachian forestry, complete with a tree-like jungle gym, and another on the French Broad River. Kids and adults can explore planet Earth and outer space through an immersive GeoDome panorama, or conduct hands-on experiments in the STEM Lab. The centerpiece is a paleontology display featuring a dinosaur replica, fossils from around the state, and a fossil pit in which budding archaeologists can dig for remains. It was important for the museum to keep a Western North Carolina focus, says Executive Director Anna Priest, who also notes that the upgraded location and new features will help give the town known as Beer City USA a family-friendly boost.